How to pre-convict and pre-punish an American Muslim. 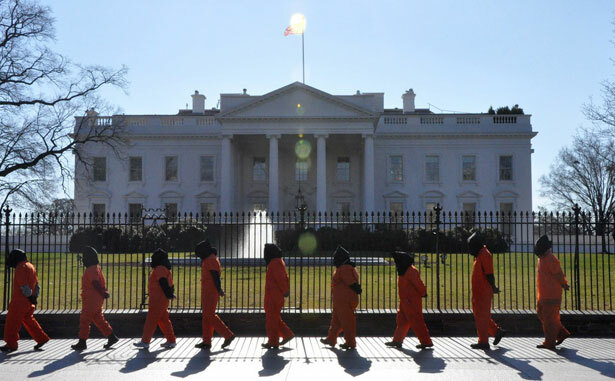 A four-month hunger strike, mass force-feedings, and widespread media coverage have at last brought Guantanamo, the notorious offshore prison set up by the Bush administration early in 2002, back into American consciousness. Prominent voices are finally calling on President Obama to close it down and send home scores of prisoners who, years ago, were cleared of wrongdoing. Still unnoticed and out of the news, however, is a comparable situation in the U.S. itself, involving a pattern of controversial terrorism trials that result in devastating prison sentences involving the harshest forms of solitary confinement. This growing body of prisoners is made up of Muslim men, including some formerly well-known and respected American citizens. At the heart of these cases is a statute from the time of the Clinton presidency making it a crime to provide “material support” to any foreign organization the government has designated as “terrorist.” This material support provision was broadened in the USA PATRIOT Act, passed by Congress just after the 9/11 attacks, and has been upheld by a 2010 Supreme Court ruling in the case of Holder v. Humanitarian Law Project. Today, almost any kind of support, including humanitarian aid, training, expert advice, “services” of all sorts, or “political advocacy” undertaken in “coordination” with any group on the State Department’s terrorist list, can lead to such a terror trial. The Court has never defined what “coordination” actually means. In that Supreme Court ruling, Justice Stephen Breyer was joined in dissent by Justices Ruth Bader Ginsburg and Sonia Sotomayor. Justice Breyer proposed a narrower interpretation of material support: individuals should not be subject to prosecution unless they knowingly provided a service they had reason to believe would be used to further violence. At the time, the position of the dissenting judges was backed by key editorials in major newspapers. In the three years since, however, more material support cases have resulted in long sentences with very little public notice or critical comment. In the U.S. these days, the very word “terror,” no less the charge of material support for it, invariably shuts down rather than opens any conversation. Nonetheless, a decade of researching a number of serious alleged terrorism cases on both side of the Atlantic, working alongside some extraordinary human rights lawyers, and listening to Muslim women in Great Britain and the U.S. whose lives were transformed by the imprisonment of a husband, father, or brother has given me a different perspective on such cases. Perhaps most illuminating in them is the repeated use of what’s called “special administrative measures” to create a particularly isolating and punitive atmosphere for many of those charged with such crimes, those convicted of them, and even for their relatives. While these efforts have come fully into their own in the post-9/11 era, they were drawn from a pre-9/11 paradigm. Between the material support statute and those special administrative measures, it has become possible for the government to pre-convict and in many cases pre-punish a small set of Muslim men. Take the case of Ahmed Abu Ali, a young Palestinian-American who is now serving life in the Administrative Maximum Facility, a supermax prison in Florence, Colorado, and is currently under special administrative measures that restrict his communications with the outside world. A university student in Saudi Arabia, he was arrested in 2003 by the Saudi government and held for 20 months without charges or access to a lawyer. The Washington Postreported that the U.S. government finally asked for his return just as his family filed a lawsuit in Washington. At the time, it seemed like a victory for the family and the various human rights organizations that had supported them, but on arrival Ahmed was charged with material support for al-Qaeda and plotting to assassinate President George W. Bush. The evidence to convict him came from an anonymous alleged co-conspirator and from taped confessions he made, evidently after being tortured in Saudi Arabia, a common practice there. The evidence of his torture wascontested at his trial. The case was described by a staff member of Amnesty International USA as “unusual in the annals of U.S. outsourcing of torture.” An appeal of Ahmed’s 30-year sentence actually resulted in the imposition of an even more severe sentence: life without parole. In addition, special administrative measures have been applied to him. These were originally established in 1996 to stop communications from prison inmates who could “pose a substantial risk of death or serious risk of injury.” The targets then were gang leaders. Each special administrative measure was theoretically to be designed to fit the precise dangers posed by a specific prisoner. Since 9/11, however, numerous virtually identical measures have been applied to Muslim men, often like Ahmed Abu Ali with no history of violence. A question to Ahmed’s sister about how her brother is doing is answered only with a quick look. She is not allowed to say anything because special measures also prohibit family members from disclosing their communications with prisoners. They similarly prevent defense lawyers from speaking about their clients. It was for a breach of these special measures in relation to her client, the imprisoned blind sheikh Omar Abdel-Rahman, that lawyer Lynne Stewart was tried and sentenced to 10 years in prison in the Bush years. Under such special administrative measures at the Metropolitan Correction Center in New York City, a prisoner lives with little natural light, no time in communal areas, no radio or TV, and sometimes no books or newspapers either, while mail and phone calls are permitted only with family, and even then are often suspended for minor infractions. Family visits are always no-contact ones conducted through plexiglass. “The conditions have quite simply wreaked havoc on Mr X’s physical and mental well-being,” one lawyer wrote for the European Court of Human Rights, describing a seven-month period in which a prisoner at the Metropolitan Correction Center was allowed no family phone calls. Another highlighted his client’s lost concentration, which made it impossible to work on his case effectively. “Their world shrinks dramatically,” was the way Joshua Dratel, a lawyer who has represented several men under these measures,described the situation. In cases where special administrative measures are in place pre-trial, such as the well-documented ordeal of American post-graduate student Syed Fahad Hashmi, lawyers have often been obliged to prepare cases without actually sitting with their clients, or being able to show them all court materials. After three pre-trial years mainly in solitary confinement under special administrative measures at the Metropolitan Correction Center, Hashmi accepted a government plea bargain of one count of material support for terrorism and was given a 15-year sentence. His crime? He allowed an acquaintance to stay at his student apartment in London, use his cell phone, and store a duffel bag there. The bag contained ponchos and waterproof socks that were later supposedly delivered to al-Qaeda, while the phone was used by that acquaintance to make calls to co-conspirators in Britain. Just as the Bush administration found the Geneva Conventions “quaint” and ignored them, so the principle of “innocent until proven guilty,” a part of Western civilization since Roman times, has all but disappeared for Muslims who face accusations of “material support” for terrorism. Such cases have, at times, involved high-profile men and once received significant media attention. Civil rights activist and University of South Florida professor Sami Al-Arian, accused of being a leader of Palestinian Islamic Jihad (a State Department-designated terrorist organization), was, for instance, treated like a man already being punished for his crime even before his trial. Previously, he had been a respected American-Muslim political leader with contacts in the White House and in Congress. Now, walking to pre-trial meetings with his lawyers, his arms were shackled behind him, so that, humiliatingly, he had to carry his legal papers on his back. Amnesty International described Al-Arian's pre-trial detention in Coleman Federal Penitentiary as "gratuitously punitive." It cited his 23-hour lockdown in his cell, the strip searches, the use of chains and shackles, the lack of access to any religious services, and the insistence on denying him a watch or clock in a windowless cell. He was transferred to 14 different prison facilities in 6 states. He ended up spending three and a half years in solitary confinement without being convicted of anything. At his trial, the government called 80 witnesses, including 21 from Israel, while his counsel called no defense witnesses, only citing the U.S. Constitution. A Florida jury nonetheless acquitted him on half of the counts, and deadlocked on the other half. (Ten out of 12 jurors wanted to acquit him on all charges.) He later struck a plea deal on one minor charge. Today, the Palestinian-American professor is still in legal limbo, under house arrest, awaiting a judge’s ruling on whether he has to testify in a separate case. An articulate U.S. Muslim political leader, who helped bring in the Muslim vote for George W. Bush after the candidate came out publicly against the use of secret evidence in trials, when the Gore campaign did not and so contributed to his Florida victory in the 2000 presidential campaign, has been silenced for his openly expressed pro-Palestinian opinions. Successful and influential Palestinian-American Ghassan Elashi, a founder and the chairman of what was once America’s largest Muslim charity, the Holy Land Foundation, and Shukri Abu Baker, its president, were similarly silenced along with three other foundation officials. The two of them received prison sentences of 65 years for giving charity to orphanages and community organizations in Gaza (also supported by the European Union and the U.S. Agency for International Development). The Holy Land leaders were accused of giving “material support” to a foreign terrorist organization: Hamas, the elected government in Gaza. There were no accusations of inciting or being involved in acts of violence. This case, like Professor Al Arian’s, would never have been possible if Justice Breyer’s views had prevailed at the Supreme Court. Even then, it took a second trial before a jury returned a guilty verdict against the Holy Land leaders. Nancy Hollander, counsel for one of the men, summed up the situation this way: “The thought that somebody gets sixty-five years for providing charity is really shameful, and I believe this case will go down in history, as have others, as a shameful day.” In 2012, the Supreme Court refused to rehear the case, and four of the five convicted men remain confined to the especially restrictive “communications management unit” at the U.S. penitentiary in Marion, Illinois, where Muslims make up two-thirds of the inmates. There were also 246 unindicted co-conspirators named in the Holy Land Foundation case, including major Muslim organizations. The case and the particularly long sentences sent a shot of fear through Muslim communities in the U.S., as was surely intended. The men’s daughters still speak out on their fathers’ case. Noor Elashi, for example, told me, “His is the poster case for 'material support. '” In the meantime, 15-minute weekly prison phone calls, monitored in real time from Washington, are the thinnest of threads to hold family relationships together, as are rare visits to distant prisons. Mariam Abu Ali once described to me her annual visit to her older brother Ahmed Abu Ali. The expense was difficult to absorb: two flights, a rental car, and a motel for a three-day visit of about four hours a day, for a family already shouldering heavy debts for legal fees. In itself, solitary confinement has devastating effects, as Dr. Atul Gawande has vividly pointed out, and is becoming ever more common in U.S. prisons in breach of internationally recognized norms on the humane treatment of prisoners. It tends to break the will of inmates, sometimes even robbing them of their sanity. However, in its most extreme use, combining those special administrative measures with the isolation imposed in prison communication management units, it is mainly applied to American Muslims. The stories of what happens to Muslim men today in U.S. prisons and of the judicial cases that land them there under the harshest of conditions bear a startling resemblance to the cages at Guantanamo Bay and the charade of a legal system that is still in operation there. In addition to the examples of prominent, formerly successful Palestinian-Americans, there are a series of haunting cases of newer Muslim arrivals in the U.S., each of them an evident miscarriage of justice. These include the Fort Dix Five, originally from Albania, and that of Imam Yassin Aref, an Iraqi Kurd. Their entrapment cases, typically based on “sting” operations manufactured by FBI informants, sent men respected in their communities into solitary confinement for long years on what were probably trumped-up charges. In such cases, the only “plot” is often manufactured by the government itself. This, then, is the state of so many cases of “terrorism” in the U.S. today in which disparate Muslim men have been swept up in a system in which guilt is assumed and people’s lives are quickly turned into waking nightmares in what used to be called the “justice system.” Some great miscarriages of justice do get overturned. Black Panther Robert King spent 31 years in prison, 29 in solitary confinement for a crime he did not commit. His release in 2001 came about by chance when his persistent letter writing attracted the attention of a young lawyer and the founder of The Body Shop, Anita Roddick, who became his champion alongside a grassroots campaign for his release. Since then, King has himself campaigned at home and abroad for the release of his two colleagues in “the Angola Three,” who still remain in prison, and against the system that could have broken him as it has so many others. Thanks to the special administrative measures applied in his case, Ahmed Abu Ali cannot do what Robert King did, or what the lawyer and a friend of WikiLeaks informant Private Bradley Manning did to get his prison conditionswidely known, or what Mumia Abu Jamal has done throughout his 30 years in solitary confinement via his books and his talks on prison radio. Ahmed cannot contact the world outside in search of the support he and his family need, nor can his family members. Perhaps such a state helps explain why people around the world are far more aware than most Americans of what happens to Muslim men in the post-9/11 “justice system.” The particular cruelty of the punishments they endure even before their unfair trials, will someday, like the abuses at Guantanamo, gain the attention they deserve. Read more on Obama's long-running War on Terror here. Victoria BrittainVictoria Brittain, journalist and former editor at the Guardian, has authored or co-authored two plays and four books, including Enemy Combatant with Moazzam Begg. Her latest book, Shadow Lives: The Forgotten Women of the War on Terror (Palgrave/Macmillan, 2013), has just been published.